Blanch the onion quarters (held by a toothpick) for about 2 minutes in boiling water. Mix the ingredients of the marinade (everything except beef and bacon) marinate the meat for about 2 hours. Oil skewers to prevent food from sticking. 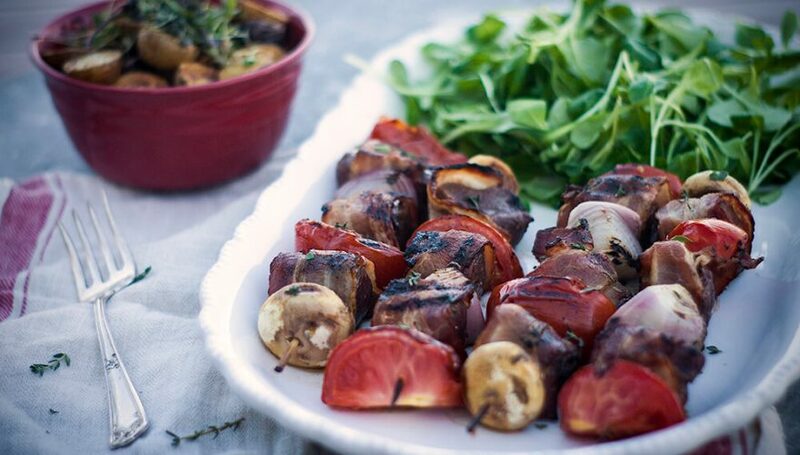 Skewer cubes of meat wrapped in bacon add the vegetables, brush with marinade and cook until meat is medium-rare and vegetables are grilled, about 2 minutes per side. Serve on a bed of rice with Bordelaise sauce… or without sauce!